Here it is, Geek Culture's shamelessly self-serving gift-giving guide for geeks! That's correct, we're flogging our own goods in the hopes of making a few geeks (and ourselves) happy this holiday season. Plus, we're featuring a few of our friends' offerings for good measure. It's an undeniable fact: every geek needs a propeller beanie. But please don't insult your geek by getting him or her one of those ugly, cheaply-made pieces of junk masquerading as the noble propeller beanie. Get them a quality beanie they will proudly wear for years. We here at Geek Culture make the best propeller beanies on the planet, bar none, and have an incredible selection of them, with the unique option of multiple propellers. Truly these are the World's Finest propeller beanies! 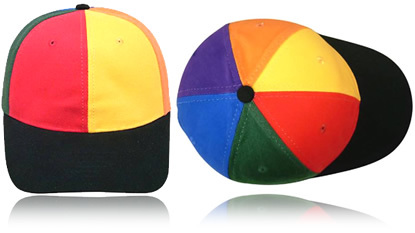 And even better, we are offering everyone the opportunity to save 15% on all our caps and beanies. Just use the Discount Code "joydiscount" in your shopping cart! You've seen them on Twit.tv, on iTunes, on Facebook, on Twitter, on books, and beyond! Now you too can join the ranks of famous geeks who have been drawn by the venerable Nitrozac! Often imitated but never matched, her work brings out the best in people and really captures the spirit of the subject. They are more natural and flattering than a caricature, but they still have a fun and timeless quality that people really love. Great for use as avatars on Facebook, Twitter, websites, as folder icons, and more, get yours here and now, as Nitrozac can only do a limited number of portaits before Christmas! And are you looking for an old tech gift for your high tech geek, consider picking up one of Nitrozac's paintings! Buttons anyone? We're famous for our unique and exclusive buttons, perfect for sci-fi loving, Mac loving, Linux loving, Woz loving, Steve Jobs loving, Tubes loving geeks! Check them out! 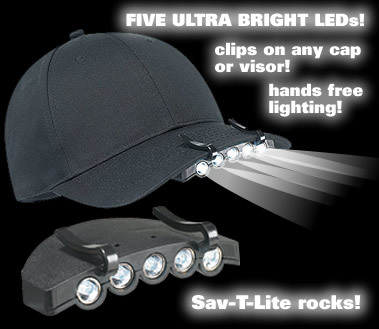 Perfect for camping trips, riding your bike, working on your car or in any situation where you need a hands-free light! Looking for a great collection of comics, and you already have our Best of the Joy of Tech book? 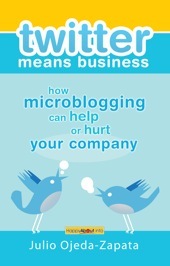 Well check out our pal Kristna's new book over at PC Weenies. 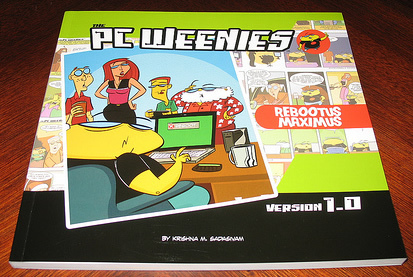 Rebootus Maximus is a fantastic self-published collection of his greatest toons, plus tons of extras. Looking for geek T-shirts but tired of wearing the same shirt that everyone else has? Afraid of giving your geek one he already has? Well, we think our friend Rick's selection is fantastic and super unique. Some great stuff for your everyday geek, and some insanely great stuff for the Mac geek. Check em all out here! And speaking of Rick Yeager and great deals, if you are in the USA and have an iPhone, you MUST download the free Yowza app for incredible mobile coupons. Rick is one of the founders of Yowza, and together with the mighty August Trometer and as-seen-on-TV sensation Greg Grunberg, they have created a really exciting way to find deals right around you. 2010 is going to be a huge year for Yowza, and we are really excited for them. BigBadToyStore.com These fine folks have an amazing selection of action figures. They did an exclusive sponsorship of the Joy of Tech, which we and our fans really appreciated, but I'm including them here because of all the really cool stuff they have. I particularly like the Gort figures, and of course all the Star Trek figurines. 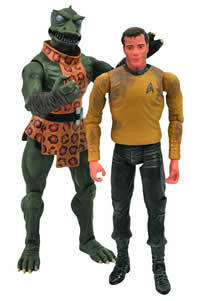 My personal favorite being Captain Kirk and the Gorn. Awww, they are so cute together. Does your geek seek more knowledge? Of course he does, it's what defines him or her! You can't go wrong with a Missing Manual book by David Pogue and many other fine authors. Whatever OS or gadget you're into, there's a Missing Manual to cover it. Other great choices for the iPhone geek: Andy Ihnatko's iPhone Fully Loaded, ...Scott Kelby and Terry White's The iPhone Book: How to Do the Most Important, Useful & Fun Stuff with Your iPhone, 2nd Edition, ... or our pal Dr. Mac's iPhone For Dummies. Take control of your gift giving with the incredible Take Control series of ebooks by the wonderful geeks over at Tidbits. 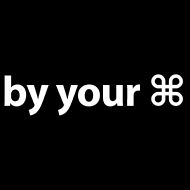 They are a fantastic series of Mac-related eBooks, just take a look at their catalogue... whether your geek is a recent Switcher, or is trying to run Windows on his Mac, needs to tame Snow Leopard, or just wants to take control of his fonts, there's a Take Control eBook for him! And if they have bigger plans in mind, treat them to our pal Julio Ojeda-Zapata's Twitter Means Business. OK, that's it for now... happy shopping!